I did a lot of travels on occasion of my professional career... Covering 'Asia' as a sales manager. Often I have taken my mountain bike with me. Left it at the luggage counter at Singapore's Changi airport. This time, I went to Kathmandu. Friendly people. Sometimes hard to understand (Indian accent). Wherever you go, they like to sell you something (...and never give up, even if you say 'no'... A rather cheap place, except the 'entrance fee' to Nepal... The hotel has organized an accompanying taxi. Use of a tour guide or an accompanying taxi is no shame. Foreigners have to give the locals a job. That' s what it is for the last 100 years and longer. My daughter made the Annapurna round, a walkway for tourists. And one (paid) guy kept her rucksack all the way... That's the way it is! Enjoy the pictures! Good luck to all the followers! I have met a friend on the occasion of the Norwegian 'Styrkeproven'. My longest tour, I ever did. The Styrkeproven starts at Trondheim and finishes after 540 kilometres in Oslo. I made it in 21 hours... My Norwegian friend decided to join me on a planned tour throughout the Alps. We started at Landeck (Austria). So, the first summit has been the Arlberg Pass. Then we have been riding up the Rhein Valley in Switzerland. Night we spent at the city of Chur. The very next day, we did two summits: Lenzerheide and Julier Pass. I remember, when I did the Julier Pass in my youth: people in the valley avoided to talk to foreigners. Of course they speak the Roman language (some of the 'ladinisch' - which is more or less the same, but with a touch of Italian (latin) influence... We ended in an expensive area. St. Moritz. [...] We left Livigno over the two Eira Passes ending at Bormio. It has been late, but there was still a little power in us: we made the Stelvio Pass from the South. Very demanding attempt! As it was late, we spent the night at the Franzenshöhe Hostel. Further down we hit Mals and later the Rescia Pass. As we ended at Landeck again and my Norwegian friend had time enough, we decided to continue by bicycle. We have been riding all the way the 'Inntalradweg' to Passau and further to Vienna, where the tour ended. Good luck to all the followers! On top of the Tremalzo Pass you find a tunnel, which you have to pass. There is a bus shuttle service for bikers accommodated in Riva, just interested on the downhill. It is one of the most famous downhill roads in Europe. You find down hillers, never seen before... But you see, from time to time bike accidents... A wonderful scenic view to the Lago die Garda paid for the effort of climb. Our tour ended in Riva. This people are prepared for bikers. You can find every spare part you need. Hotels and restaurants are prepared for bicyclists. We left Riva, after a rest day, by a shuttle bus, back to Austria. Good luck to all the followers! We have been at Hamburg for a couple of days. Riding the local bike ways (Elberadweg - to Willkommhöft). With the train to Wilhelmshaven and then: Ostfriesland. Following the coast to Carolinensiehl, passing Horumersiehl and Schillig, we finally ended at Wangerooge. Wangerooge is a family place. But people are friendly, we found accommodation at the 'Westturm', an old light house. Riding back via the beautiful and quite and clean Ammerland; heading to cross the river Weser by ferry. I remember Oldenburg and surroundings. After crossing the river Weser we made a stop at Worpswede, a city dedicated to Artists. Riding back to Hamburg we crossed over via 'Das Alte Land' - a huge garden. Full of all kind of fruits. Last stop at Harburg, directly at the river Elbe. Crossing the river Elbe by ferry, landing at Blankenese, Hamburgs high society quarter. Good luck to all the followers! We said: we can do it on our bicycles...: The Route des Grandes Alpes. Starts on Lake Geneva (Genfer See) and is one of the famous French routes through the Alps to the Mediterranean. It leads, from Lake Geneva to the Côte d'Azur and crosses 16 high alpine passes (nine of which more than 2000 m), including the Col de l'Iseran, the highest road pass with 2770 m in the Alps. The route to overcome about 700 km long with an altitude difference of 15 700 m. The 1913 opened for the first five individual stages range is now 600 km from Department of Streets and along 68 km of national roads. Several cuts are stages of the Tour de France. Passing Martigny, and climbing the Forclaz Pass, heading for Charmonix. On the foot of the Aquille du Midi we have seen the huge glacier which winds down near Charmonix. Impressive: the climb up on the Roselend road. After the good experience on the Amalfi coast, we tried further South: Sicily. For a round trip to large... Anyway, we climbed up the Etna road (elevation round 2.000 meters). We had a rest day at the city of Belpaso. This people understand to live! I remember an excellent Grappa, we have been offered...! Leaving Belpaso, we followed the costal road to Messina. Crossing the sea street by ferry. We went up the Aspromonte mountain range. Interesting experience. We continued in going back by ferry to Island Sicily and followed the North costal road. Wonderful climbs, untouched nature. Interesting little villages; often found on top of a mountain. Going back 'home' (to the airport Cantania), has been a very powerful ride, because of the high numer of hills... Good luck to all the followers. My daughter Anne, a very brave bicyclist, joined me. After a long winter we like to see the sun again... Unfortunately, we have seen rain and snow again... The best part has been the Lago Lugano (on Italian side...) and the Lago di Como (North shore - wonderful detours to avoid the Hwy tunnels...). We have visited Madonna di Ghisallo, whereas a museum and a bicycle monument is there... Nevertheless, Madonna di Ghisallo is elevetad by round 800 meters, what means: climb bicyclist, climb! Recommended to see this wonderful bicycle path... Good luck to all the followers! Half way of the classic tour to Lago di Garda. But still nice, as it covers the prim half part. Interesting the climbing over Schlapiner Joch, Scaletta and most interesting Alp Chaschauna. A sort of power check... Livigno is a very nice ( and rather cheap - no tax) place to stay. We left Livigno, using the tunnel to the lower end of the Passo Fuorn (Ofenpass). Further down the Inntal bicycle path way. Ending at Landeck, whereas we catched the train back to Vienna. Good luck to all the followers! 1st day: start at Innsbruck (after a night travel by train): Innsbruck - Brennero - Lana (a wonderful bike path down the Eisack valley). Distance: 140 kilometres. 2nd day: Lana - on the bike path to Trento and back. Distance: 115 kilometres. 3rd day: Lana - Prad - Stilfer Joch - Umbrail - Santa Maria - Meran - Lana. Distance: 176 kilometres. 4th day: rest day (it is not recommended to go by bicycle to any Alpine road due to heavy traffic of motorcycles). 5th day: Lana - Kastern - Sant Nicolo - Mendel Pass - Gampenpass - Lana. Distance: 90 kilometres. 6th day: Lana (by train to Mals) - by bicycle to Reschenpass (a new wonderful bike path), and on the ``Inntalradweg'' to Landeck. by train, back to Vienna. Distance: (by bicycle) 90 kilometres. Starting at Feldkirch (Austria), we followed the Upper Rhein bike path, which leaded us nearly to the city of Chur. As it starts raining, we went by bus over the San Bernardino pass, down to the city of Bellinzona (Ticino). Via Monteceneri we hit Lugano. The Italian side of the lake is just wonderful. Not so extreme busy as on the Swiss side. Looks logical we followed the road to the Lago di Como and further to the city of Sondrio. At Tirano we have crossing the boarder again. Back to Switzerland and up the Bernina pass from the South. Nor recommended - too strong head wind. With our very last power, we have been climbing up the Passo Forcola. Downhill to Livigno on low speed to avoid further cold. Fingers went stiff! The very next day, we left Livigno in snow. Snowflakes at night covered the landscape with snow powder. We have been one of the last bikers leaving Livingo Tunnel by bicycle. Today they have installed a bus shuttle service. Down the Ofenpass (Passo Fuorn) to Zernez and further the Inn valley bike path to Landeck. Now the very last part close to Landeck is finished. Good luck to all the followers! We tried hard. To our surprise we ended in a snow field. If weather would have changed, we won't be more able to publish this page... As the weather didn't change, we had a wonderful tour. Passing Val di Vizze, ending at the Inn river valley bike path. Good luck to all the followers! By train from Vienna to Milano. Following the route 'Milano - San Remo'... Left the route near Genova and riding the Cinque Terre coastal road. Visiting Carrara. Back home via the Passo Cisa. And further North along the Lago di Garda. Hit the train again at Innsbruck. Good luck to followers! One of the best tours in Europe. Fun, good weather, good landscape. Down the Amalfi coast - like Hwy 1 in California. Good luck to all the followers! Eifel - Mosel - Rhein - Germany's best ! Eifel: old German houses, friendly people. A secret bicycle path: the Kyll Radweg. Leads you directly down to the city of Trier at the river Mosel. Mosel: so many loops; for what the river Mosel is known for. On road: 100 kilometres; on water (and bicycle path) 180 kilometres. Very good touristy infrastructure: lodging, food. Rhein: bicycle path not a throughway. Needed: some intuitive findings. Cynthia Wong, Kekoa Proudfoot, Phil Sung, Lisa and I just returned from the Tour of the German Speaking Alps. As tours go, the statistics were unusually bad: we got in 945 miles and 88,916 feet of climbing, of which 13,879 came from 4 hikes we did in Switzerland, meaning we got in only 75,037 feet of climb on the bike. We only had 2 flat tires, both of which were caused by a bad tire blowing out on descents. We did lose almost a week to rain, and another 3 days due to a number of us (myself including) getting sick on tour. 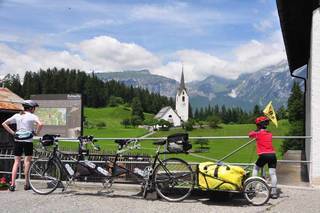 This is our family trip with our son, and a loaded triple through eastern Switzerland. Biking with an eight year old, means more chances to stop and enjoy the scenery, but still be able to climb through the mountains. We're back! It's the Main Bike Path once more. We again find time for a few days cycling along the Main, this time from Würzburg to Aschaffenburg. The weather couldn't be better for this scenic ride with picturesque towns between the Spessart and Odenwald mountain ranges. The east part of Switzerland and the West part of Austria. Great mountains, great nature! The wonderful Jura, the beautiful lake of Ginevra, the great land of lakes. This is a tour in French Switzerland, from Como to Ginevra... this is Calvino anniversary! Five days on the road from capital to capital and back. Starting with the crossing of the Downs and Sussex Weald, ferry from Newhaven, on to Paris via Dieppe and Gisors. Return along the Seine and Andelle valleys. Includes practical information about the tour. A gentle four day ride from London to Amsterdam. First leg through the pretty villages of Essex and Suffolk to Harwich, followed by three days on the North Sea cycle route visiting Den Haag, Noordwijk and Haarlem. Der Süden von Frankreich ist wunderbares Fahrrad Touren Territorium. Der attraktiven Mittelmeer Küstenstrasse der Côte d'Azur entlang, die Route Napoleon in den französischen Alpen, der mächtige Canyon du Verdon oder auch die traumhafte Insel Korsika. One month on the bike for over 2000 kilometers from Switzerland to Mallorca. Alpine crossing of Switzerland, snowy winter days in the French Alps, coastal road along the Mediterranean Sea, the challenge of the Pyrenees, wild romantic Costa Brava, Gaudi dominated Barcelona and finally around the island of Mallorca. Ein Monat auf dem Fahrrad für die über 2000 Kilometer von der Schweiz nach Mallorca. Alpen-Cross durch die Schweiz, verschneite Wintertage in den französischen Alpen, Küstenfahrt dem Mittelmeer entlang, der Lockruf der Pyrenäen, wild romantische Costa Brava, Gaudi dominiertes Barcelona und schlussendlich die Umrundung der Insel Mallorca. Fahrrad Tour durch die Alpen der Schweiz, dem Inn Tal entlang in Österreich, Oktoberfest Pause in München, Schloss Tour in Tschechien mit der faszinierenden Hauptstadt Prag und schlussendlich über Dresden nach Berlin.